Pikachu and the rest of the group practice singing and dancing, as well as rehearsing their segments, until they realize Luchabull (Hawlucha) can't sing! Now it's up to Pikachu and everybody else to encourage Luchabull into getting back on cue before they have to do the show for real! Will they succeed? So, I say this as a Pokemon fan who has seen... a lot of stuff. 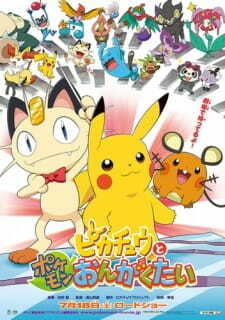 This was probably one of the worst things I have seen for the Pokemon franchise. I think saying "this is fine for kids" is kinda insulting to kids? I mean I guess I didn't mind watching it I at first wanted to rate this 5 but the more I thought of how I wanted to skip to the ending and how much the "singing pokemon" annoyed me until the end when they finally got it together. I mean sure the end result was OK. The drama was OK. I think Pokemon are cute. But... this was a really annoying special. There is no getting around that. I could have given this anywhere from a 1-5. The animation was great as ever honestly. And the Pokemon were cute to me... and when you find Pokemon cute it is hard to not be so biased to your own feelings when you have seen nearly 1000 episodes and are used to it. But I chose 3. But if you rate this a 1, I wouldn't fault you. But if you like it that is fine too. This is a long series haha. And you might have thought Pokemon singing badly was cute.